Christmas in July is a Thing — Triangle Pastry Co.
Well, I had never heard of Christmas in July, but it is a thing that people do. A bit confused, albeit not wanting to be a scrooge, I hung these festive paper lanterns on loan from my market neighbors, Planetary Elixers. Marlene doesn't shy away from any reason to add flair and she's always willing to share. Triangle Pastry Co. tent at the Apex Farmers Market Christmas in July Festival. As my contribution to the event, I made a bread pudding with croissants and it was amazing. Those slices sold out faster than I could say Croissant Bread Pudding, so I will definitely have it available for the holidays -or anytime by order ($40/pan). See a cross-section of a test run in the picture below. It's very much like a cannelle in loaf format, but without the rum (sorry, kitchen rules), otherwise you know I'd be buying bottles of Lassiter's by the case for these beautiful pastries. 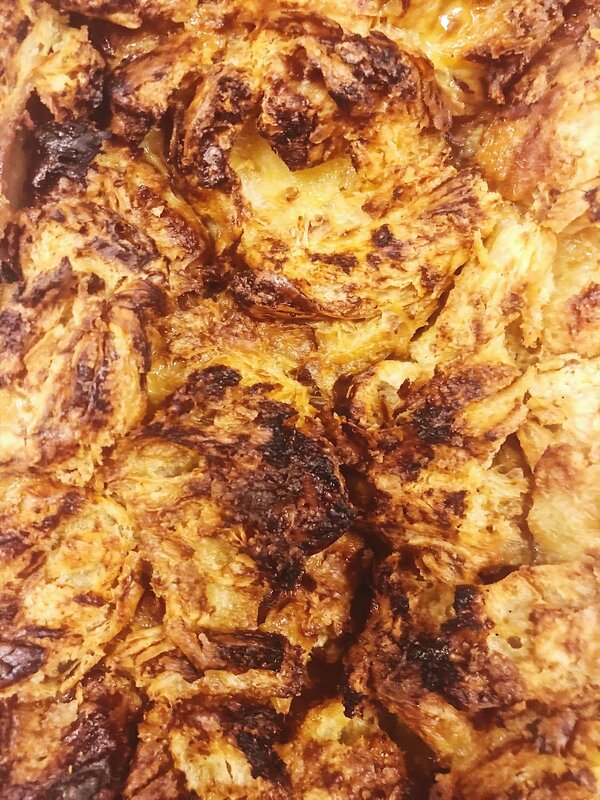 Croissant Bread Pudding. This one is laced with almonds, coconut, and banana jam, to lend a summery vibe. The crust on this bread pudding had a delicious caramel flavor. In the past couple of weeks, I also started bringing some less decadent items like granola, crackers, flatbread with seasonal toppings, and chips, for those who have less of a sweet tooth. Stop by and see me at the Apex Farmers Market next week for some breakfast, snacks, and pastries for Sunday brunch. Have a great week, Apex!